Established in the year 1968, we, “Adilec Systems”, are considered as the noteworthy manufacturer and exporter of a comprehensive assortment of Automotive Cables, Elevator Cables, and Uninyvin Cables. The offered products are manufactured using ultra-modern machinery, current technology, and superlative grade raw material. The offered products are manufactured using ultra-modern machinery, current technology, and superlative grade raw material. Our provided products are quality assured and are in conformity with the set industry principles. These are widely acclaimed among our valuable customers for their dimensional accuracy, robust construction, optimum finish, reliable performance and easy installation. Apart from this, the offered products are available in various sizes, designs and dimensions to suit the varied requirements of our esteemed patrons. In addition to this, the offered products can be availed by clients from us at the most affordable price range. Under the agile leadership of our mentor, Jimit K. Deliwala (Partner), who is a veteran in the concerned domain, we have scaled new heights of success in the industry within a short span of time. Along with his support, our team has been able to work in a coordinated manner in order to serve varied requirements of our clients. We export our product "Globally" . To surpass the expectations of our customers, contributing to improve their efficiency through excellent service and the most advanced technical solutions in the design, development, production and sale of cables for the transmission and distribution of energy and information. Customer Satisfaction is dependent on optimum quality of the products. Our motto is to keep our clients completely satisfied by delivering the best quality products while ensuring on-time delivery and the most competitive pricing. FLEXON is reputed manufacture and project supplier of quality cables .FLEXON is the fastest growing Company in cable industry, offering the widest range of wires & cable. FLEXON Single & multicore PVC Industrial Wires & Cables find a wide range of application in the control panels, appliances, machine tools, machinery and are used in almost every industry. We have an up-to-date infrastructure in Mumbai enabling us to manufacture Cables and for the requirements of almost all Core Industries. We also have a well trained technical staff. A well equipped Laboratory ensures well planned testing and quality control procedures. Our facilities enable us to adapt to changing technology. We wish to delight our customers. Establishing long term mutually beneficial relations with our customers, based on the long term. 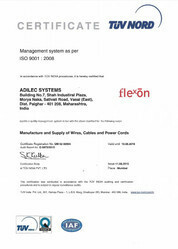 Flexon is a leading manufacturer of high-quality cables for power, control, signal, instrumentation. It also manufactures Automotive Cables, Elevator Cables, Uninyvin Cables, Domestic Cables, Industrial Cables, Instrumentation Cable, Indian Plugs, European Plugs, UK Plugs, African Plugs, American and Japanese Plug. Flexon products are used throughout the nation in a wide variety of demanding industrial and commercial applications, including factory automation and robotics, materials handling, processing, packaging and building services. Whatever your cable application you can be sure Flexon will have the solution - look inside for information on the product that suits your requirement. We deal on own manufacturing brand "Flexon".